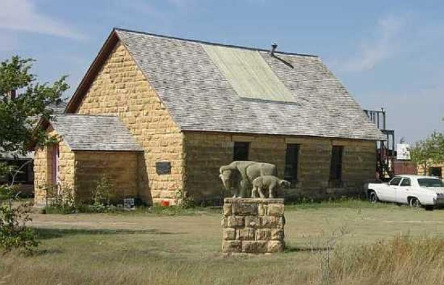 Located on the southern portion of the Western Vistas Historic Byway, Keystone Gallery overlooks the Smoky Hill River valley with a scenic view of Monument Rocks and fossil outcroppings of the "Badlands of Kansas" region. The native limestone building was a church from 1917 until 1953, then sat abandoned until 1991. Although only off of the highway a few yards, Keystone Gallery is off the grid, generating its own electricity. Inside enjoy the Kansas fossil museum and artwork by Chuck Bonner and Barbara Shelton. Open 9 a.m. until sunset most of the summer, but hours vary greatly in the winter. Call for an appointment or take a chance!